The bank account used to collect revenues from Chad's oil pipeline has been frozen by order of the World Bank. The closure of the London-based Citibank account is the latest sanction taken by the World Bank, which says Chad has broken a loan agreement. It is angry at a new law giving Chad's government more access to profits from the pipeline, which takes oil to Cameroon for export. Some of the profits are meant to be set aside for fighting long-term poverty. In a statement posted on the Chad government website finance minister Abbas Mahamat Tolli said the World Bank move was "totally unjustified". "It is unacceptable that a nation should have its access blocked to revenues generated by the sale of its own natural resources. 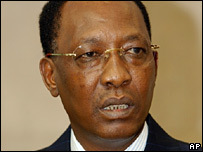 "Chad's government ... will take appropriate action to recover the legitmate rights of the Chadian people," he added, without spelling out what actions his country intended to take. Oil company Exxon Mobil, which operates the pipeline, said it was assessing the situation. On Thursday Chadian President Idriss Deby gave his final approval to the new law on oil revenues despite the earlier suspension of World Bank loans worth $124m (£70m). He denounced last week's move by the bank as foreign pressure and an attack on Chad's sovereignty, saying his government needed some of the oil money now to finance improvements in health and education. The law abolishes what was known as the "future generations fund", separate from the London bank account, which had kept 10% of the country's oil revenues for use in tackling poverty in Chad. "The oil revenue needs to be used for the welfare of our youth instead of being put aside for future generations as the World Bank wants us to do," Chad's Foreign Minister Ahmat Allami told the BBC's French service. He said the government wants to use the $36m held in the fund to deal with some of the country's more immediate financial problems. The World Bank had lent Chad more than $39m for the Chad-Cameroon pipeline on condition that non-government groups checked its use of oil revenues. 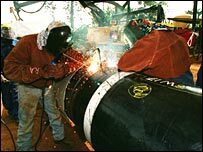 The private sector arm of the World Bank, the International Finance Corporation, also lent another $100m and mobilised a further $300m for the 1,000km pipeline. Bank president Paul Wolfowitz accused Chad's government of acting "unilaterally" after the law which Mr Deby approved was passed by parliament two weeks ago. Up to the end of 2005, Chad earned $399m from the export of 134m barrels of oil.